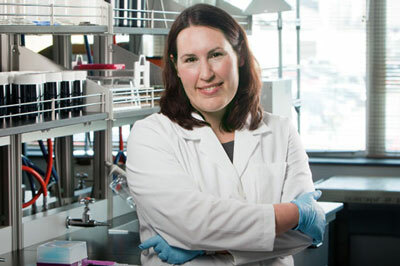 (Nanowerk News) Anthony Fiumera, associate professor of biological sciences, and Gretchen Mahler, assistant professor of biomedical engineering, are collaborating on a research project funded by a Transdisciplinary Areas of Excellence (TAE) grant to discover the role ingested nanoparticles play in the physiology and function of the gut and gut microbiome. The gut microbiome is the population of microbes living within the human intestine, consisting of tens of trillions of microorganisms (including at least 1,000 different species of known bacteria). Nanoparticles, which are often added to processed foods to enhance texture and color, have been linked to changes in gut function. As processed foods become more common elements of our diet, there has been a significant increase in concentrations of these particles found in the human body. Fiumera and Mahler believe understanding nanoparticles’ ability to influence our metabolic processing may be integral to mediating metabolic disorders and obesity, both of which are on the rise and have been linked to processed foods. Fiumera works in vivo with fruit flies while Mahler works in vitro using a 3-D cell-culture model of the gastrointestinal (GI) tract to understand how ingesting nanoparticles influences glucose processing and the gut microbiome. By using complementary research methods, the researchers have helped advance each other’s understanding of nanoparticles. Using fruit flies, Fiumera looks at the effects of nanoparticles on development, physiology and biochemical composition, as well as the microbial community in the GI tract of the fly. The fly model offers two advantages: 1) research can be done on a wide range of traits that might be altered by changes in metabolism and 2) the metabolic processes within the fly are similar to those in humans. Fiumera also aims to investigate which genes are associated with responses to the nanoparticles, which ultimately may help us understand why individuals react differently to nanoparticles. For this project, Mahler expanded her GI tract model to include a commensal intestinal bacterial species and used the model to determine a more detailed mechanism of the role of nanoparticle exposure on gut bacteria and intestinal function. Early results have shown that nanoparticle ingestion alters glucose absorption, and that the presence of beneficial gut bacteria eliminates these effects. Mahler was already investigating nanoparticles when she reached out to Fiumera and proposed they combine their respective expertise. With the help of undergraduate students Gabriella Shull and John Fountain and graduate student Jonathan Richter, Fiumera and Mahler have begun to uncover some effects of ingesting nanoparticles. Since they are using realistic, low concentrations of nanoparticles, the effects are slight, but eventually may be additive.